The little blue book, now in its third year, will continue to delight readers interested predominantly in cricket in Asia. India has much to cheer from 2014. Although the men were ultimately overcome, their victory at Lord’s was only their second such success at Headquarters and the women won their first Test match in England at the picturesque Wormsley ground. Wisden India selects six Cricketers of the Year and, for the first time, a woman cricketer has been picked. A shame perhaps that her name is missing on the photograph page but Mithali Raj, being one of the sport’s biggest stars, will be well enough known to many of the readership. Joining Mithali are Ajinkya Rahane, Rishi Dhawan, Pakistan’s Umar Akmal, Sri Lankan captain Angelo Mathews and Bangladesh’s Mominul Haque thus giving fair representation to most of the countries embraced within this Almanack. Two stalwarts and legends of Indian cricket, Vijay Hazare and Bishan Singh Bedi, are inducted into the Hall of Fame and, like the main Almanack, there are many fascinating articles. Phillip Hughes’s tragic death is mentioned in the notes by editor Suresh Menon but, as worryingly and sadly, is the fact that other cricketers have also succumbed to their injuries whilst playing. One is mentioned within the pages whilst another more recent accident happened after publication but serves as a reminder of the game’s dangers. Once again, Wisden India is an excellent read and reference book. 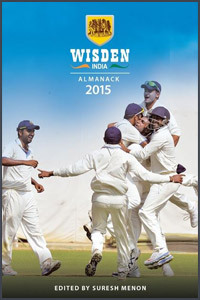 After the Indian Cricket annual finished in 2004 after fifty-seven editions, Wisden India has the opportunity of becoming the main, authoritative yearbook on Indian and Asian cricket.